The Cobblers have announced they have frozen season ticket prices for the seventh year in succession. The club has announced how much it will cost to buy a season ticket for the new campaign, which kicks off in August, and it will set back Town fans the same as it did in the summer of 2011. Cobblers are currently battling to secure their survival in Sky Bet League One, but no matter what division the team end up in come the start of the new campaign in August, adult season ticket prices will start at little more than £10 per game. “The 2017/18 season has been a season of change for the club,” said chairman Kelvin Thomas. “In September we were delighted to make the appointment of Jimmy Floyd Hasselbaink as our manager. “After a glittering career as a player in the Premier League and a successful start to his managerial career, we were very excited to welcome Jimmy to the club and he and his coaching staff have worked hard to improve, re-shape and reinvigorate the squad over the past few months. “We made a significant investment in the squad during the January transfer window and I think the changes made have generated optimism and excitement amongst supporters. “That transfer window was a particularly busy time as we recruited strongly. “A number of players arrived, many of whom are young and fiercely ambitious but who also have experience of playing at this level and that helped them hit the ground running. 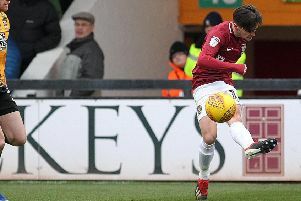 “The thrilling win over MK Dons at Sixfields in January in front of a near sell out crowd, the win at Bradford City and an excellent draw away at Blackburn Rovers hinted at some of the ability the new look squad has. “But the recruitment wasn’t just made with the short term in mind. You can visit ntfcdirect.co.uk for further details, or call Northampton 683777 between 10am-5pm Monday to Friday, or from 10am on home matchdays. Supporters can also visit the ticket office at Sixfields.